We are pleased to share our new publication "Socio-economic analysis of the biodiversity products' value chains for the creation of the socio-environmental development strategy of the Fazendinha APA - Amapá state" - which aims to promote sustainable livelihoods in the Brazilian Amazon. Conducted in partnership with the Brazilian Agricultural Research Agency of Amapá (EMBRAPA-AP) and the Brazilian Environment Ministry (MMA), this study supported the development of territorial development strategies in the Fazendinha Environmental Protection Area (APA) - located south of the city of Macapá, in Amapá state - using economic analysis of ecosystem services. We identified priority ecosystem services (ESs) for the value chains of tourism, açaí fruit and andiroba oil, and investment opportunities for the development of the Fazendinha APA and its value chains. The Fazendinha APA was created in 2004 to reconcile the needs of the local population, environmental protection and the development of economic activities through the sustainable use of its natural resources. Working groups during the workshop on Fazendinha APA's ESs value chains. We collected information about the prioritized value chains through a literature review, interviews with specialists (from government, civil society and the private sector) and an interactive workshop attended by representatives from the APA community , public sector and research institutions. In March 2018, we held a two-day workshop, "Fazendinha APA's ESs and Value Chains - an approach for strengthening territorial and sustainable activities" at EMBRAPA-AP's headquarters, in Macapá. Twenty-six professionals participated, representing local communities, local government bodies (such as the tourism secretariat) and research institutions. The workshop provided a rich exchange of information among local actors and experts. Map of Fazendinha APA with its value chains. Our study identified valuable information to support the future APA's Management Plan, such as the current state of activities, land use and the local value chains' infrastructure, the value chains' main bottlenecks and the social objectives of the selected value chains. 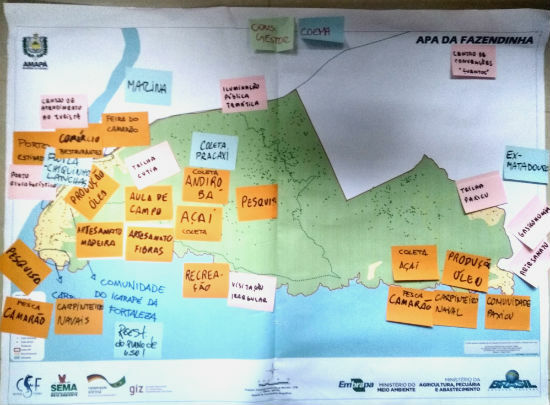 We also completed an evaluation of the priority investments for strengthening ecotourism and extractivism (açaí and andiroba fruits value chains) in the Fazendinha APA. One of our conclusions is that sanitation and waste management are major bottlenecks for the development of the APA's value chains, as they directly and negatively impact the inputs on which value chains depend (such as water and scenic beauty), and, thus, need to be addressed before any direct investments in infrastructure for tourism and for extractive products processing are made. Participants of the workshop on Fazendinha APA's SEs e value chains. We presented these results in a second workshop in Macapá in July 2018. One of our project's results is the increased awareness among decision makers (APA councils, environment secretary and tourism secretary) on strategies and priority investments. Ultimately, we hope that our report and data will support the stakeholders - together with the community - in developing a sustainable development plan for Fazendinha APA. Our Our study's results presentation in Macapá. This study was conducted with the technical support of the MMA and the EMBRAPA-AP and the financial support of the German Cooperation Agency in Brazil (GIZ) as part of the project "Conservation of Biodiversity through the Integration of Ecosystem Services in Public Policies and Business Performance - TEEB Regional-Local (TEEB R-L)", whose objective is to highlight the benefits that biodiversity and ES promote for society, as well as the increasing costs of its loss or degradation, aiming at a greater integration of the value of the ES in decision making processes.